Spencer 59 2015 with CAT C18 Engines With Platinum Warranty, CAT 21 kW Generator, PipeWelders Tower With Anodized Dipped Welds, 2 Cabins & Oversized Crew Areaand 2 Heads With Master Forward. Beautiful Teak Interior. Maintained By Full Time Captain, Shows Beautifully. Showings By Appointment in Stuart, FL - a convenient 25 minute drive from Palm Beach International Airport - PBI. United Yacht Sales New Jersey would love to guide you through a personal showing of this 59' Spencer Custom Carolina Sportfish 2015. 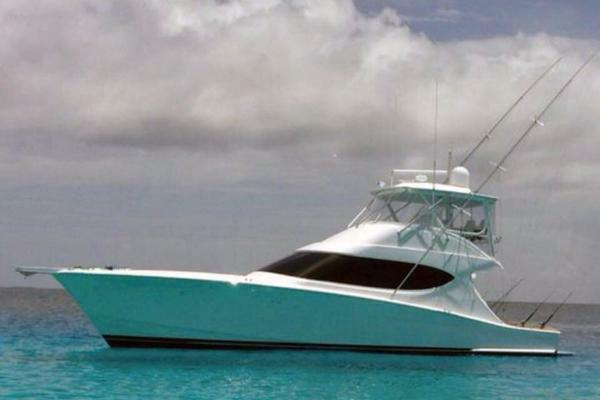 This yacht for sale is located in Stuart, Florida and priced at $2,995,000. For a showing please contact us by filling out the form on this page and we will get back to you shortly! Teak Interior, Two Full(2) Staterooms, Master With Ensuite Head Forward, Guest Cabin With Upper and Lower Berths and CrewOversized Upper/Lower BerthsAlong Spacious Companionway. Luxurious Designer Softgoods. Owners personal effects, fishing rods, reels, tackle and gear, tools, life raft and EPIRB will not convey with the sale of the vessel. Vessel Name cannot be retained.